Earlier today, we wrote the Intel Z390 launch may be low-volume because Intel's 14nm production capacity is completely utilized. This will likely result in a second-wave of Z370 motherboards, which is a 22nm chipset. 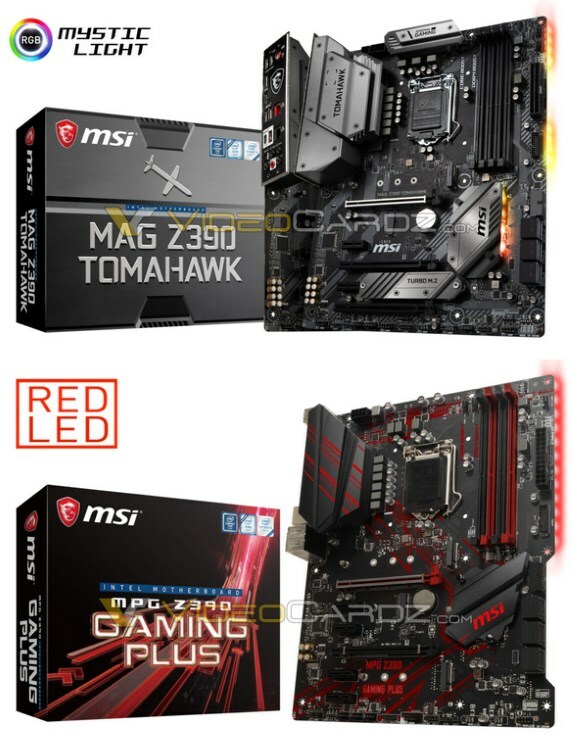 VideoCardz did manage to score photos of two upcoming Z390 based motherboards from MSI; the MAG Z390 Tomahawk and MPG Z390 Gaming Plus. MEG is the new higher-end series, while these two MAG and MPG motherboards are situated in the mid-range segment. The MAG Z390 Tomahawk has a black and silver design and seems to have a preinstalled I/O bracket. Next is the MPG Z390 Gaming Plus, that board uses a black and red color scheme and has a much bigger heatsink over the VRM area than the Z370 predecessor. MSI also copied the cut near the SATA connectors, which is usually found on the ASUS APEX line.